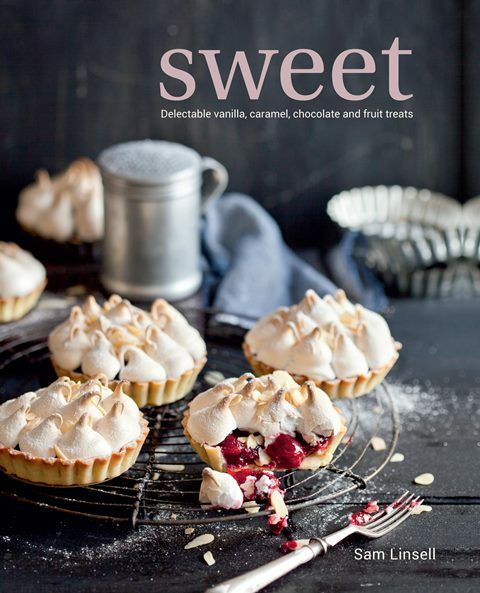 Sweet by Sam Linsell is all about delectable vanilla, caramel, chocolate and fruit treats. Each recipe has a short introduction followed by the method and a photograph, taken by Sam. Sam’s photographs are distinctive and easily recognizable. The recipe book starts with sweet vanilla, and as I love all things Italian I would make the sbrisolona (p24). The 2nd chapter is sweet caramel and the caramel chocolate sauce (p37) caught my eye as using herbs in sweet dishes intrigues me. Sweet chocolate follows on and I would adapt the white chocolate and rooibos tea fudge (p70) if possible. The bourbon butterscotch sauce (p82) which goes on top of the chocolate waffles sounds delicious. I have never baked a cake in my microwave but I would definitely try the 45-second chocolate pudding with salted caramel (p93). Next is the chapter on sweet fruit. Sam has reproduced the recipe from her blog for granadilla curd (p111) which was inspired in part by a recipe for lemon curd. The crimson grape and red wine sorbet (p116) sounds like the perfect post harvest dessert. Sam’s honey meringue frosting (p124) is so going on my next cake. Sam used it to top lemon pistachio cupcakes. As I’ve always got egg whites to spare I will be making the cranberry amaretti biscuits (p136). My dad and nieces are on a gluten free diet so I would bake the lemon marmalade polenta cake (p156) for them. The last chapter is more sweet and covers a variety of recipes including sweet whipped butters (p164) and Pimm’s® popsicles (p172), which would make a great summer wedding treat while the bride and groom are having their photographs taken. Sam had asked me for a recipe for her book and as she had told me she had never made a soufflé I developed the Cinnamon And Coffee Soufflé recipe for her. Sadly for me, Sam did not include the recipe but she did make a spicy chocolate soufflé (p90). Interesting recipe. I just can’t resist.Awesome presentation. They all sound delicious! What a great cookbook! WOW! These sound amazing!! That white chocolate tea fudge?! WOW! What fun, SWEET recipes!! The cover photo alone makes me want to get this book! Sounds like it’s filled with great stuff. What a lovely cover… the recipe titles sounds so tempting!!! Can’t wait to see you make something wonderful from this book!